You may remember my post a couple months ago about a new bee I'm in, The Traveling Quilts. Well, we were going to keep our quilt additions a secret to surprise the bee member at the end of the year. That lasted about 3 weeks. LOL So now that we are NOT keeping things a surprise anymore, I can share with you! For round 1, I received the below blocks from Jacquie from Tallgrass Prairie Studio. 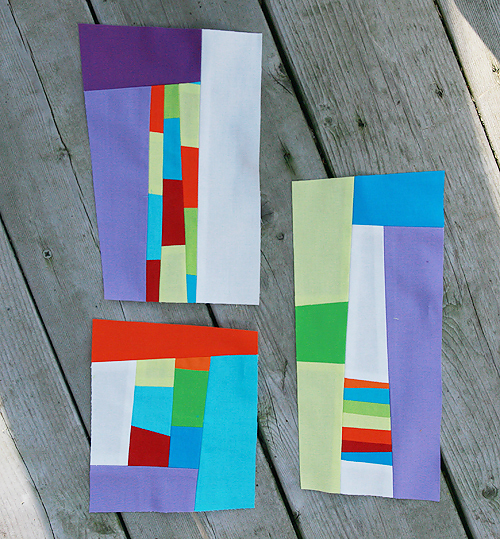 She started her quilt using bright colors and improvisational piecing. My additions are at the top of this post. I continued her use of purple and small punches of bright colors. I am really happy with how they turned out, and now they are in the hands of Ashley to continue the quilt top. 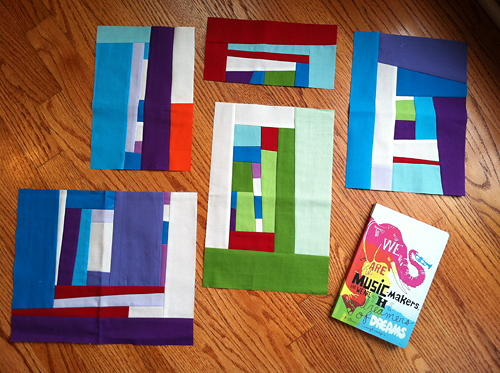 I have Penny's quilt blocks now and can't wait to share what I'm working on for Round 2!